New Zealand has a rich alpine vegetation, with the range of species being greatest in the mountains of the South Island. Golden tussocks, spiky spaniards, rounded hebes and delicate alpine shrubs coexist in a fascinating environment. Accessing these environments can be as easy as driving through the Arthurs or Lindis Passes or as hard as ascending unstable scree slopes in the Fiordland mountains. The Mount Cook lily is probably the most famous of our native flowers. It is not a lily at all but a member of the buttercup (Ranunculus) family. Its pure white flowers with golden centres are held above large, green, dinner plate like leaves. Many other members of this family have beautiful, deep yellow flowers. 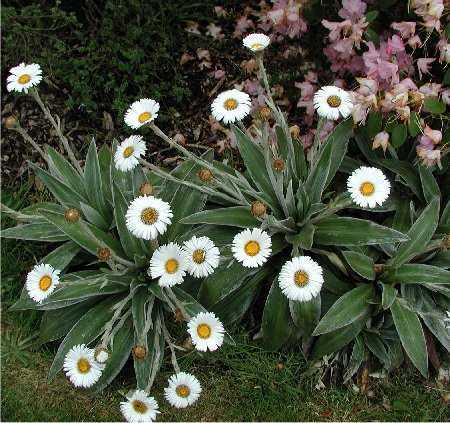 Mountain daisies (Celmisia) are a characteristic feature of our mountain vegetation. Their leaves have a wide variety of forms. Celmisia traversii has bright green leaves with rust coloured hairs underneath and on the side and Celmisia incana has leaves which are completely covered in white hairs. The dense felt of hairs is for insulation against the cold environment which most plants inhabit. They generally flower between late spring and early summer. Their white daisy flowers have yellow to orange centres and are usually held high above the leaves. 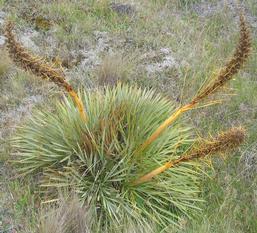 The spiky speargrass or Spaniard is New Zealand’s most vicious plant. Even thick gaiters are no defence against its spiny, sharp leaves. However it is a distinctive part of our alpine flora and there is nothing quite like the sight of a slope of speargrass flowerheads waving in the wind. Flower heads have been recorded up to 4 m high. The tussock fields of the South Island high country are a stunning sight. Few people drive over the Lindis Pass without stopping to admire them gently blowing in the wind or illuminated by morning or evening light. Tussocks can grow up to a metre high and wide. They may live for a century or more. They are survivers, able to withstand strong winds, extreme drought, snow and fire. Many New Zealanders are very fond of the native hebe. They are common sight in gardens across the country due to their abundant flowers and attractive foliage. They are neatly rounded shrubs with leaves precisely arranged at right angles in four vertical rows. The whipcord hebes are a distinctive group, with leaves reduced to scales. Their height varies from 5-10 cm up to 2 m and they range from coastal through to high alpine zone plants.